A Flood in the Streets of L.A.
My grandpa bought me a Honda 50 minibike for my 10th birthday. It was 1972, when the sight of a 10-year-old driving a motor bike raised few eyebrows, and I rode that Honda all over the Westside neighborhood where I lived at the time. I roared up and down the alley behind the UCLA married students’ housing on Sawtelle Boulevard and around the church parking lot at the end of the block. That was fun, but I really wanted to take it off-road. A month later, my cousin Marc got a dirt bike for Christmas, and my grandpa offered to take me over to Baldwin Hills so we could ride together in the undeveloped lot next to Marc’s house. Marc’s family lived high in the hills. The vacant lot was a big dirt pit, about the size of football field. It dropped down into a huge bowl below the street-level, then rose up five stories on the other side to where the rim of an old reservoir had once been. It was overgrown, abandoned, desolate, and perfect for riding dirt bikes. But this place hadn’t always been so idyllic. Just nine years earlier, this very lot had been the site of a reservoir—and a massive public works tragedy. The Baldwin Hills Reservoir was constructed by the Department of Water and Power to provide water to Los Angeles residents in the event of an emergency. But on a sunny Saturday in December 1963, the reservoir created the emergency. Nearly 250 million gallons of water burst through its northern wall in just over an hour, sending a wall of water that reached 50 feet high down the hill and inundating a triangular area bordered by La Brea Avenue, La Cienega Boulevard, and Jefferson Boulevard. The flood killed five people and damaged hundreds of homes and cars. Sitting there on my motor bike, nine years after the calamity, the vacant lot seemed mysterious to me. I could feel the presence of ghosts; deserted sites always remind me of people who are no longer there. A weird, rusted-out drainage pipe stuck straight up out of the lowest point in the gulch. It was about the same diameter as those old aluminum garbage cans and was taller than I was. Its top was sealed, but the sides had softball-sized holes all over. I wanted to know how deep the pipe went into the ground. I reached inside and dropped in a couple of rocks. It was deep. What the heck was this thing? Marc explained that rushing water from the flood had gouged away massive amounts of terrain. But beyond that he was no help. He had lived next door to this thing his whole life, and if it ever did interest him, that interest had waned. I, on the other hand, was eager to explore. I asked if he had seen the remains of the old reservoir with his own eyes. He had. We were playing just below an overgrown earthen ridge that had been erected where the dam had once stood. It had been the northern wall of the reservoir. To see whatever was left of the reservoir, we would have to trek a quarter mile up the hill to the end of his street and jump a fence. “Let’s go check it out,” I said. “No. We’re not allowed to go up there,” he answered. Clearly he had broken this rule at least once, but not today. Marc was content to ride his motorcycle, but I was distracted. I wanted to see what was beyond the ridge. What did an abandoned reservoir and dam look like? Would there be an old watchman or caretaker to shoo pesky kids away? Would you be able to get close enough to see anything? Or would we be blocked by a locked gate? Every time I visited Marc, I would try to figure out a way to circumvent our parents’ prohibition against venturing up there to explore. I could never come up with a plausible justification that would convince them to allow us out of their sight. Looking back, they were right to keep such a tight rein on us. It remained a mystery and a source of childish fascination. 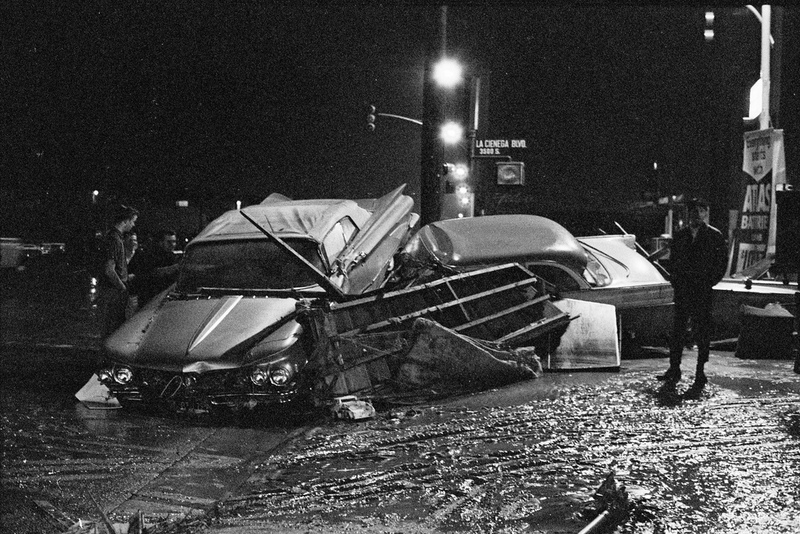 December 14, 2013 marks 50 years since the Baldwin Hills Reservoir disaster. I recently asked my mom—who went to high school nearby at Bishop Conaty and is now a retired technology consultant living in Phoenix—if she knew anything about it. Oh, yes. On the morning the dam broke, she was headed to the Baldwin Hills Shopping Center to go to the May Company, and the police were blocking off the streets. The dam didn’t just suddenly burst, she told me. It began with a small breach that engineers furiously tried to repair. In the meantime the police quickly evacuated the homes and retail areas in the water’s path. Because of their efforts, only five people would die that day. My dad was not so nostalgic. I knew he had gone to Dorsey High School, which was in the flooded area, but I hadn’t known he was also living in the disaster area then. He was a medical student at USC and was sharing an apartment at Coliseum Street and Santa Barbara Avenue with a medical supplies salesman. He remembers the water getting up to three feet deep and his roommate’s Alfa Romeo being swept three blocks away. At La Cienega Boulevard and Rodeo Road, shoppers at Fedco (where Target stands today) were caught by surprise when water rushed across the parking lot toward the store. As the story was later conveyed to me, a young secretary and her mom were offered refuge by one of the mechanics in the automotive bay. He cleared the top shelf of automotive supplies, and they remained perched up there until help arrived. Technically, the reservoir wasn’t in Baldwin Hills. It was in a sub-division called Baldwin Vista, on the west side of La Brea Avenue. (Baldwin Hills is on the east side of La Brea). Baldwin Vista was and still is a slightly more desirable community. Unlike Baldwin Hills, there is no through-traffic. All of the streets terminate in dead-ends and cul-de-sacs. Baldwin Vista also benefits from being in a less urban neighborhood. It isn’t surprising that homes sold quickly once they were rebuilt after the flood. Jo Henderson owns a couple of those houses. One is next door to where my cousin’s family used to live. She said all of the homes on the east side of Cloverdale Avenue were destroyed, and the front yards of the homes on the west side were washed away. The home directly across the street looked like it had just lost its yard—then the owners discovered that the crawl space under their house had become a giant pit. Initial speculation was that the dam ruptured because it was situated on an earthquake fault line. Attention later turned to the construction of the reservoir. Some engineers involved in the project would claim that they hadn’t liked the design from the very beginning. Ultimately, fingers were pointed at the oil companies operating the wells along La Cienega; the official conclusion of federal geologists was that oil companies had over-pumped the fields and caused damage to the geological structures supporting the dam. The site sat abandoned for two decades after the flood until it was turned into the Kenneth Hahn State Recreation Area. The public entrance to the park is on the east side of La Cienega Boulevard in the hills between Rodeo Road and Stocker Boulevard. The park stretches across the canyons and ridges between La Cienega Boulevard and La Brea Avenue, north of Stocker Boulevard. A large oval footpath circles around open parkland that was laid where the old road that ringed the reservoir once existed. The flood was only the first of three disasters the area’s residents endured. Baldwin Hills is surrounded by lower-income neighborhoods that sustained damage during the Watts riots. Since then, the commercial districts in the area have suffered, as merchants are still reluctant to locate business there. The riots in 1992 didn’t help. But, the community continues to change and prosper. The Baldwin Hills Shopping Center now hosts a weekly farmers’ market. There is also a Baldwin Hills Conservancy plan to convert the oil fields along La Cienega Boulevard (a constant visual reminder of the cause of the flood) into a state park, thereby beautifying the area and restricting the development of new homes. The plan includes a golf course, trails, and an amphitheater. The disaster survives mainly through the old-timers in the park who tell flood stories on the jogging path and in the picnic area. But I will remember other things. Most of all, I will remember a couple of kids on motor bikes who had the freedom to claim all that open space as their own, sharing it with only a few dozen gophers, a jack rabbit, and some mysterious, long-forgotten ghosts. Drew de la Houssaye is a lifelong Angeleno-phile and can be found on Twitter @MadCribs, where he tweets about celebrity homes, architecture, and real estate economics. Primary Editor: Kathryn Bowers. Secondary Editor: Joe Mathews. *Photo courtesy of Rob "Shawdog" Helfman.